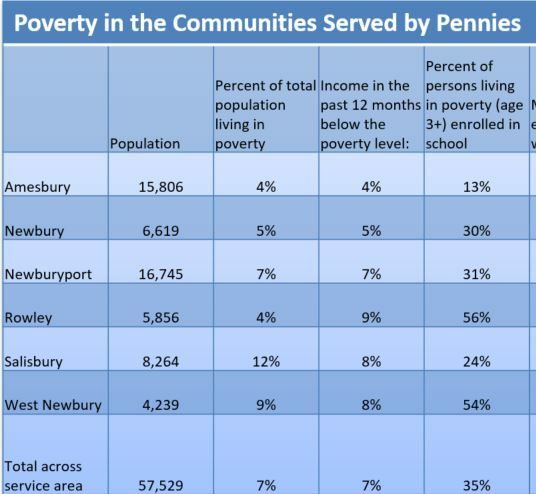 As shown, in the six towns served by Pennies for Poverty, from four to 12% of the population live in poverty, as defined by the federal government. That definition doesn’t take into account the costs of today’s healthcare, housing and other essentials so the true rate of poverty is much higher. 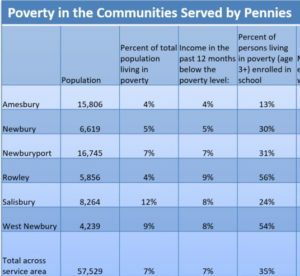 Pennies for Poverty maintains an online searchable directory of local social services. Try it out: Resources Directory for Greater Newburyport. Nonprofit organizations in Greater Newburyport have begun posting their volunteer needs on the website VolunteerMatch.org. The site makes it easy for prospective volunteers to find local opportunities that fit their interests and skills. Volunteers can register to get email updates as new listings are posted. It is free and easy to use. Try it out. Go to VolunteerMatch.org and get started.